French toast first appeared in 1871, when it was called called "pain perdu" or "lost bread." The recipe used stale bread, which would have otherwise been thrown out or "lost." Here's how you can make your own in 16 different and delicious ways. Who doesn't love the rich taste of Nutella? 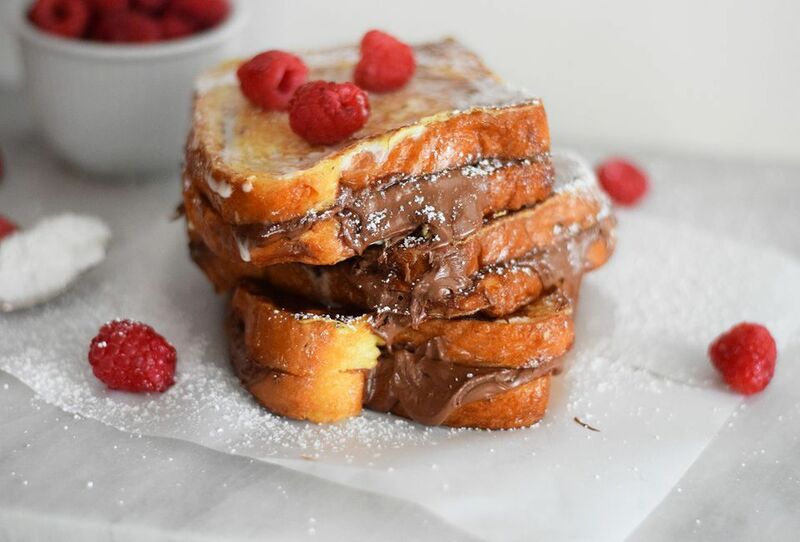 This delightful and slightly over-the-top recipe is stuffed with everyone's favorite chocolate-nut spread for the most decadent breakfast on this side of heaven. Try serving it with fresh berries for a pretty presentation. A decadent overnight French Toast bake is the perfect holiday breakfast when you really want to pull out the stops, but not spend all morning over the stove. This recipe uses raisin-studded panettone, but it works well with any bread you have on hand. Try it with cinnamon swirl bread or even babka. If you or your family follows a vegan diet, that doesn't mean you have to give up French toast. This recipe uses bananas instead of eggs, making it vegan and slightly sweeter than the standard. Sliced fresh bananas make a wonderful topping for this toast. These fun and kid-friendly stuffed French toast roll-ups are great for a special breakfast or breakfast-for-dinner. The sweet cream cheese filling and oodles of blueberries are a delicious sweet and fruity combination. Add a sprinkle of powdered sugar and a drizzle of maple syrup and you've got a picture-worthy start to the day. 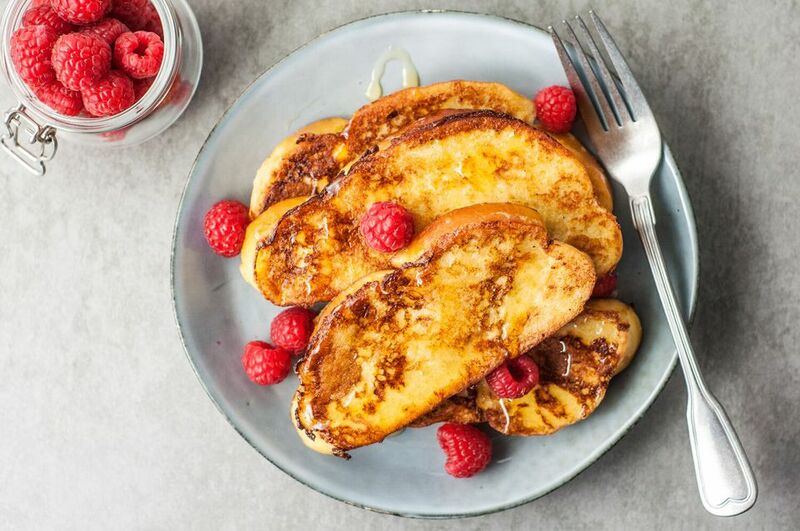 You can gussy up French toast with a little vanilla or cinnamon, bake it in the oven like a bread pudding, or wrap it around sausages, but the basic ingredients are constant: bread, milk, and eggs. Master this recipe and get creative! Wake up to your favorite holiday beverage in breakfast form with this spiced eggnog French toast. It's creamy, rich, and custardy no matter what kind of bread you use, though it's better with a rich challah or brioche. Use slightly stale bread for even more holiday-worthy results. Yes, you can have French toast, even on busy weekday mornings. This make-ahead version can go straight into the freezer for a later date. It also calls for cornflake crumbs, but other varieties would mix up the flavor nicely. Try it to use up your kids' leftover cereals. Stuff this French toast baked casserole with your favorite fruit compote and preserves for a breakfast to impress. It's ideal for a holiday brunch or even a potluck since it goes in the oven. Chopped fresh fruit would also mix in perfectly. Play with the combination to find your family's favorite! Using a sizzling hot skillet gives this easy stovetop French Toast a delightful crispy exterior, while leaving the inside rich and creamy. Make sure you really saturate your bread for that custardy interior and get the butter foaming before adding the bread. This isn't just any French toast recipe. It's pain perdu, New Orleans-style. Use thick-sliced French bread for best results and make sure you really soak it. That could take up to 10 minutes, depending on how stale your bread is. Serve dusted with powdered sugar for an authentic presentation. Kids and kids-at-heart both love this quick hand-held breakfast. It's great for a crowd and you can make a double or even triple batch to freeze for later. Just reheat in the microwave, oven, toaster oven, or a hot skillet. French toast sticks are all grown up in these crunchy granola-coated beauties. Use your favorite brand for a sweet, crispy exterior. They barely even need syrup, but a dollop of whipped cream or even vanilla ice cream would make it extra special. Think outside the bread aisle with a pound cake French toast. It's buttery, rich, and decadent even without syrup or topping. Serve it with fruit compote or fresh fruit and whipped cream for a real breakfast or brunch treat—or even dessert! Sick of the same old breakfast? Make these sausage French toast roll-ups for a fun meal everyone will love. Use bread that flattens easily; any small breakfast sausage links work well, too. Enjoy this lighter take on French toast without blowing your diet. It uses two eggs and two egg whites to cut back on cholesterol, but you won't notice the difference in the flavor because cinnamon and vanilla gives it a nice spice. Fresh fruit makes a beautiful accompaniment. This cinnamon-spiced blueberry French toast casserole makes any morning special. The dish is prepared the night before, making it perfect for a holiday breakfast or brunch. It's similar to a bread pudding, so it can easily double as a dessert. Top it with whipped cream or serve it warm with ice cream.